New extensions of Coca-Cola's "Share A Coke" campaign just keep on coming. Most recently, Coke teamed with JetBlue to set up a special vending machine in New York's Pennsylvania Station. The machine dispensed two Cokes to each person who used it, and screen messages urged users to give away the second bottle ("Share a Coke for Humanity," "Share a Coke with a New Friend," "Share a Coke with Anybody"...). Users were filmed as they shared their Cokes, and as a JetBlue representative rewarded each sharer with a pair of free, round-trip tickets. 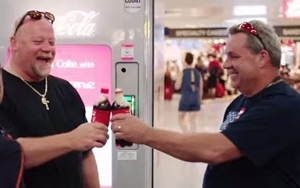 Out of 150 people who used the machine, about 70% opted to share, Coca-Cola told FastCoCreate. A two-minute video of the action pulled more than 8,000 views on YouTube within the first two days after being posted on July 20 by JetBlue and promoted on the brand's Facebook and Twitter channels. In case anyone was still wondering why new variations on "Share a Coke" seem to be everywhere this summer, Coca-Cola chairman and CEO Muhtar Kent credited the campaign as one contributor to a 5% increase in organic revenues, and an 8% gain in comparable income before taxes, in North America during the second quarter. The company's soda brands saw a 1% increase in case volume in the region, and transactions increased 2% due to strong growth in smaller-size products, such as mini-cans, he reported. Increasing prices on traditional sizes of soda brands, and focusing on the smaller sizes that cost more per ounce, were also key in driving revenue. Worldwide soda volumes increased by 1%, including a 1% gain for Coke, 6% for Coca-Cola Zero, and 3% growth for Sprite – although Diet Coke's volume declined 7%. The company's overall beverages volume grew 5%, mainly driven by non-carbonated offerings, including ready-to-drink teas and bottled waters. Kent cited increased and "disciplined" marketing on a global basis, with emphasis on enhancing the quality of advertising, as crucial to the overall stronger-than-expected Q2 results. "In the markets where we are investing more with better quality, we are seeing better performance," he said. "Marketing, along with solid execution by our bottling partners, is driving top-line growth across our emerging, developing and developed markets."